"The Blind man taps his cane rhythmically. Three taps, three taps, three taps to gain the attention of passing Berliners. He is a cadaverous sentry with a shaved pate under an old soldier’s cap, selling pencils from a canister strung about his neck. A pyramid of dots are stamped onto the armband he wears, and his round black goggles are like two holes poked through the day, letting the night bleed through. Sigrid fishes out the coin purse from her bag as she emerges from the U-Bahn stairwell, and drops a few groschen into his cup, “Bless you,” he rasps in answer to the jangle. “Please choose a pencil.” She thanks him, but when he turns his head in the direction of her voice, something behind the blindness of those goggles seems to mark her. She puts the pencil into her handbag and crosses the street at the signal." My current audiobook (on CD in the car) is both tense and intense. Enjoyment is not really the correct word, but it sure is compelling. I liked this one a lot. Hope you're enjoying the book. Kaye - I wouldn't really call it enjoying, but am totally absorbed in this book. Have requested a print copy from the library so I can get through it faster, but am still a long way from the top of the waiting list. David - Thank you for commenting! Your novel immediately drew me in (almost unwillingly) to life in Berlin during WWII. I'm on chapter 12 now and wish I had more time in the car. Suzanne Bertish is the PERFECT reader - her delivery keeps me on edge, tense, and wanting more. Do authors have input on the audio production? This is very well done. My publisher, Amy Einhorn, is terrific with her authors, and involves them in most all such decisions. I was sent a batch of auditions , and the moment I heard Suzanne, I knew that she would get my vote! Also, I have to mention the director, May Wuthrich, who did a terrific job as well. It's amazing the strange power that words on the page take on when spoken aloud. I call into book clubs a lot around the country, and just came across and audio book club — all the members had listened to the book, and were all bowled over by the performance. I have been wanting to read this one! Thanks for sharing...and for visiting my blog. Laurel-Rain Snow - I am not usually a fan of war novels, but am totally hooked on this one. Paulita - The writing is marvelous, and the novel is disturbing and though-provoking. I've looked this one over at the library. Look forward to your thoughts. 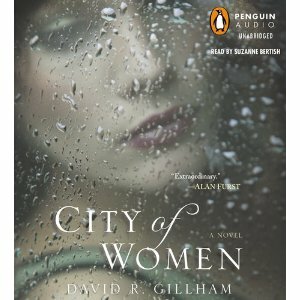 Nise' - Not sure I would have chosen this on my own, but am thankful PenguinAudio sent a review copy. Quite curious about this one. Like the intro, I'd keep reading/listening. thanks for playing along. Diane - This is very different from my usual fare... a good change of pace! I've seen this one around and I swear someone else highlighted this one a week or two back...sounds very interesting. Looking forward, as usual, to what your final feelings are! Staci - You're right. Margot featured this a couple of weeks ago. I haven't listened to anything quite like this. The reader is perfect! The quote you chose certainly is compelling... can't wait to hear more about this book! Chinoiseries - I'm hoping for more 'alone time' in the car so I can finish soon!